Beef Back Ribs with a dry rub and made in the Instant Pot using apple cider vinegar as the liquid. 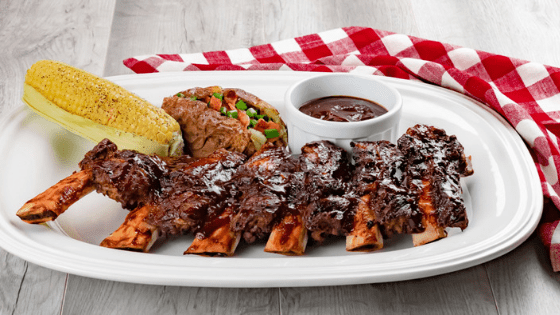 These ribs are finished in the oven for a crispy texture and coated with your favorite BBQ sauce. To prepare the ribs, you will need to remove the membrane from the back of the ribs. It is easy to do this by finding the thickest part of the membrane and peeling it away from the ribs. Using a paper towel to grip the membrane makes it a little easier to keep ahold of. After removing the membrane, rub the dry ingredients over the ribs and cover to refrigerate for at least an hour. This gives the ribs a chance to absorb the spices. The longer the ribs sit with the seasonings the more flavorful they will be! After cooking the ribs in the Instant Pot, remove them and lay them on a foil lined baking sheet. Baste the desired amount of BBQ sauce of your choice on the ribs and bake in the oven for 10-15 minutes. One thing I love about my Instant Pot is its ability to make meat super tender and fall off the bone in very little time. These ribs are pressure cooked for just 25 minutes and they’re so tender! To make these ribs crispy, they do require oven time to reach the much-desired crispiness when eating ribs. I use apple cider vinegar as the liquid for the ribs versus water for a very good reason – water tends to make meat bland when pressure cooking. By adding the apple cider vinegar, the flavors infuse into the meat instead of taking flavors away. In fact, I rarely use water as the liquid of choice in most of my recipes! Have more than 1 rack of ribs to make? No problem! You can fit more than one rack of ribs in the Instant Pot and you don’t even have to adjust the cooking time! Of course, you will want to double the ingredients to make 2 racks at once to maximize the flavor but no additional steps! Remove membrane from the beef back ribs. In a small bowl, combine all the dry ingredients and blend well. Rub the dry ingredients evenly to coat the ribs. Cover and refrigerate for at least an hour - even longer for more flavor. Place trivet inside the inner liner of the Instant Pot. Place the rib rack inside the pot, curving the ribs to make them fit. Pour the apple cider vinegar into the middle of the pot. Close the lid and the vent, cook on MANUAL for 25 minutes. Allow pot to perform a NATURAL RELEASE for 15 minutes. Line a baking sheet with aluminum foil and lay the ribs onto the foil. Baste with the desired amount of BBQ sauce and bake in the oven for 10-15 minutes (depending on the desired amount of crispiness).